Baton Rouge-bred Kenny Neal talks blues and tells Alex Bieler what he thinks of Erie's winters. As you've likely read in Contributing Editor Cory Vaillancourt's recent cover story, Blues and Jazz Fest is a family affair, with moms, dads, brothers, sisters, cool uncles and aunts, and weird uncles and aunts all joining in on the weekend fun (if you haven't read Cory's story yet, I'd suggest you click on this wonderful link here and enjoy his lovely arranging of words). Appropriately, Blues and Jazz Fest headliner Kenny Neal is quite a family man, being part of a mighty blues heritage that includes father Raful and several brothers and sisters. I had a chance to chat with the Grammy-nominated musician about his family and playing the blues. Alex Bieler: When did you first start playing music? Kenny Neal: Oh, that's kind of hard to answer that. I've probably been playing since before I realized I was playing, but I can remember when I was 6 years old I was playing a talent show, maybe a little older. I don't know what year "Mustang Sally" came out, but that's the song I did in my talent show. AB: You're part of a huge musical family. What's that like? KN: Well my dad, Raful, he decided he wanted to be a musician instead of a sharecropper, so he went out bought a harmonica and started playing that thing when he was a kid, and that's how it all started. He was raised not by his biological family, so the people that raised him were farmers and he just fell in love with Muddy Waters and Jimmy Reed and Howlin' Wolf and decided he wanted to play blues. So by the time I came around, he was around 21, him and Buddy Guy was playing together and Buddy Guy was my dad's guitar player. I just grew up in that field of business. AB: Our first ever cover story was on Buddy Guy. Did you learn a lot from playing with him? KN: As far as the music, I already got the training from my dad. When I ended up joining Buddy's band, I already had it down. What I did learn was that there was a much bigger, broader audience for the blues than just locally around my town. We always played around Baton Rouge and the state of Louisiana with my dad. I never realized that the blues was so big around the world and when I started touring with Buddy Guy and Junior Wells, that's when it really hit me that it was bigger than I thought it was. AB: Being from Baton Rouge, what kind of impact did your hometown have on your playing style? KN: Now that I'm older, it really made a big impact on me because I learned a lot of stuff from the older guys that I didn't realize that I was doing at the time. I didn't go have training in school, so my training was just to pick up from all of the local guys that I was around, and I was around them all of the time because I was hanging with my dad. When I look back on it and I play the stuff that I know how to play, I was really fortunate that I picked it up, because it's something special. I really learned that deep swamp blues, Cajun style of music that we have coming out of Baton Rouge. AB: What drew you to come and play in the Blues and Jazz Fest? You a big fan of Erie? KN: I've been coming around that area for a long time, so this gives me a chance to come back out there and play because I've been coming for about close to 30 years. One thing was the winter used to kill me, but it was good times. Even though there was snow and cold, we always ended up having a great night. 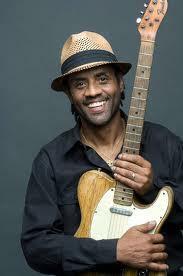 Kenny Neal performs at the Erie Art Museum Blues and Jazz Festival on Saturday, August 3 at 8 p.m. For more information on the lineup, click here.